The Hummingbird in the Jungle. There once was a jungle, where tall trees grew from thick roots, where a river coursed through the green thicket, where thick vines snaked around and about. A tapestry of shade and sun, green and brown and blue, moss and soil and sand and rock. It was beautiful and it was good and it was home. Until the night that lightening struck a tree and the spark exploded into a hundred more sparks. The night when the jungle began to burn. The animals ran to a safe distance to look at their home, on fire below them. Jaguars and cougars stalked angrily. Sloths and spider monkeys whispered fiercely about their sadness and shock, how there was nothing to be done. Frogs croaked their mourning as the fire burned and burned and burned and burned. There was also a single hummingbird, not much larger than the size of a penny. As the fires burned, she flew to the river below and loaded a single drop of water — all that would fit — onto her beak, flew towards the fire, and dropped it onto the orange nightmare enveloping her home. The other animals looked on, unable to understand. That story is adapted from environmental activist Wangari Maathai. I thought of it today, looking at this picture of people lined up on the streets of Paris, ready to donate blood after the recent terrorist attacks. I thought of it when I learned the name Adel Termos. 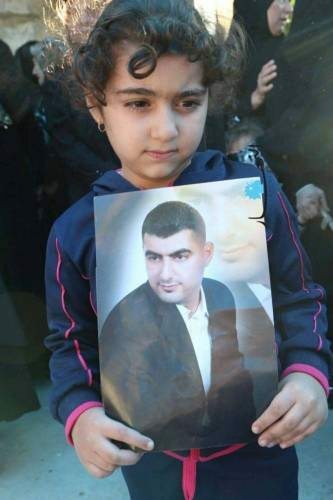 That’s his photo, held by his daughter. He was killed after throwing himself on a suicide bomber in Beirut three days ago, saving the lives of dozens while sacrificing himself. 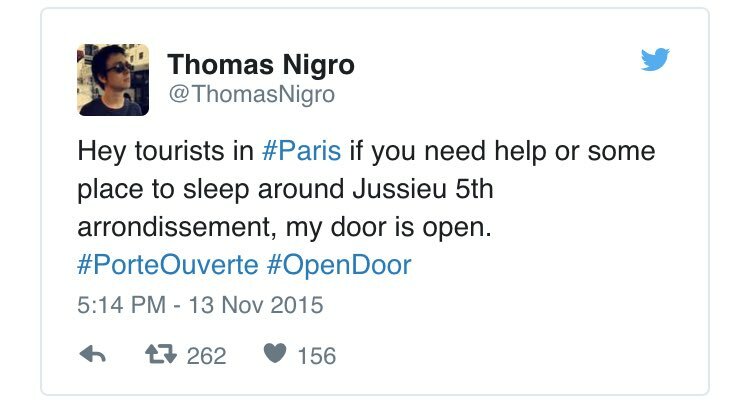 I thought of it when I read the hashtag #PorteOuverte, which stands for “Open Door” — the system that sprang up instantly of people offering their homes as safe havens to those stranded by the attacks. I’m in America. I watched the news on Friday night, almost motionless on the couch, paralyzed by watching horrific events unfold from the comfort of a warm living room, a fuzzy chenille throw over my lap. I read, with increasing sadness and horror, that there were recent attacks by ISIS in parts of the world that I knew nothing about, that had not been afforded the same outcry and public grief. I recognized, with a shudder of recognition, that even briefly scrolling through Twitter revealed Islamophobic statements, angry voices crying over one another, anger and sadness and fear. I’m still in that living room, with that warm blanket draped over me. I am warm, and I am safe, and others have lost everything. I likely will never have cause to throw myself upon a suicide bomber, or open my door to a stranger fleeing an armed terrorist with a machine gun. I hope that is true. I so very much hope that is true. The other animals began to watch as the hummingbird flew, her wings starting to tire with fatigue, as she flew to retrieve her single drop of water from the river and drop it over the fire, again and again and again. The snakes and sloths climbed to the tops of the trees that were not yet burnt, affording them a new vantage point. They could see a path to the river that had not yet been destroyed. By guiding the others with their voices, they steered the elephants towards the riverbed, where they sucked up gallons of water in their trunks and doused the roaring flames. Other birds flew by the hundreds, placing water in their beaks, a sea of brightly colored wings and feathers, releasing drop after drop after drop after drop. The drops of water fell onto the writhing, terrifying flames below, sizzling and cooling, one after another. I made all that last part up. I wrote that part of the story myself, the toucans and the elephants and the snakes and sloths, all of it from my own imagination. The story actually ends with the hummingbird saying “I am doing whatever I can.” That’s it. That’s the end of the story, at least the part that I’ve read and can credit to Wangari Maathai. I can imagine the rest of it, though. That someone would see the hummingbird’s example and begin to help. To feel guilty, even: that the smallest of the animals could be making a difference, while so many others stood by in silence, or in fear. Since I’m writing the story, the temptation is to write the ending that I want, that I desperately crave. That the animals, following the hummingbird’s example, extinguished the fire. That they remembered how they had saved their home by working together that day, and passed their story along to their children, and grandchildren, and great-grandchildren, so that no animal in the jungle would ever die as a result of not knowing what to do when lightening hits the tallest tree. On the other hand. Fires burn hot and hard. One drop at a time can’t save an entire forest, and neither can a few gallons’ worth of elephant’s trunk water. The jungle might burn to the ground. The animals might all die. That’s possible. That’s realistic. And if that’s true, maybe the hummingbird doesn’t matter. It all burns, no matter what. I can’t finish the story for you, because I don’t know how it ends. I don’t know whether or not terror, which can spread like fire through our hearts, is going to be fueled with ignorance and lies, misunderstanding and fear. I’m not going to write the end of this story because I don’t know if the hummingbird is going to get help from the rest of us. I don’t know if those in Beirut and Syria and Iraq and France who need help are going to receive it. If the rest of us will feel guilt for letting the smallest and poorest among us suffer alone. I can’t finish this story because I know there’s a chance that we could all burn. That our homes could be destroyed, by something senseless, something hot and angry, something that arrives in the night and takes without giving back. That others in the rest of the world live with this fear, feeling the flames on their face every single day of their lives. My jungle doesn’t have drones flying overhead. I fear money and car crashes and cancer, not bombings and gunfire. I don’t want to be a useless animal on the banks of the river. I love this big beautiful jungle of a home, a country, a planet, a world. I want to be a hummingbird. I am doing whatever I can. Here’s a link to learn more about organizations that help Syrian refugees. Here’s a link to learn more about helping the victims of the Paris terror attacks. Here’s a link to better understand the differences between Muslims and Fundamentalists. CLICK HERE TO READ THE FOLLOW-UP: The Hummingbird, Part Two. What to do and how to make a difference? One drop at a time in your own community, in your area, in your space.Such a beautiful metaphor. I get so frustrated when people throw their arms in the air, saying – why should I? The problem is too big.- Well Humanity is bigger. We must be able to find a way and it starts in our personal space, as you say, ‘doing what I can’. Breaking down walls through simple acts of humanity which can be as simplistic as a nod of the head in acknowledgment of another. Reaching out and touching each others humanity. This is another though provoking post. Thank you. This is touching and beautifully written. Being in France right now, I can attest that the fear is palpable. When I think about the hummingbird’s words, “I’m doing whatever I can,” I ask myself if I can say the same. Thanks for sharing this! You wrote… “I likely will never have cause to throw myself upon a suicide bomber, or open my door to a stranger fleeing an armed terrorist with a machine gun. I hope that is true. I so very much hope that is true.” Sadly, we face other types of adversity here in the united states like movie theatre and campus shooting sprees. It’s beyond perplexing that we must experience the ugliest part of humanity for the most beautiful side of humanity to emerge. I want to be a hummingbird too. It is in my nature, probably my DNA, to do something however small. Thank you so much for this. I love this story, it is truly beautiful – If only more people could hear it then maybe the world could be a slightly better place.